If you are fickle minded like us and can’t decide which theme you like best; that is where the International Seafood buffet theme should satisfy you. On Mondays, diners are treated to a myriad of cuisines from all over the world—including local, Japanese, Thai and Western. Begin your meal with salmon sashimi and nigiri sushi before proceeding to the Crustacean Seafood Counter which is filled with snow crabs, mud crabs, prawns, and mussels on ice. Over at the live station, the chefs will whip up a generous portion of Singapore’s iconic Oyster Omelette and Singapore Laksa. Of course, you simply must not skip the highlight at the chef’s table – Slow Roast Angus Beef Prime Ribs, Seafood Thermidor, Braised Pork Knuckle with Black Vinegar and Red Wine Vinegar and Whole Baked Norwegian Salmon. More seafood options at the buffet include Stir-Fried Thai Style Clam, Kong Poh Style Prawn, grilled lobsters and the DIY Rojak and Kueh Pie Tee stations. The new Asian Seafood buffet theme, happening every Tuesday at J65 pays tribute to traditional Asian culinary techniques that we are all familiar with the use of finest ingredients and spices of the region; where rich flavours and aromas are so vibrant and the tastes brings back memories of good old home cooking. The chefs’ Asian creations are mouth-watering with many varieties for one to choose from soups to congees, from curries to masak lemaks, from braised to fried and grilled to baked! All with the freshest of seafood! You must not miss the Korean baked seafood, Teriyaki Salmon, Seafood Tom Yum, Chili Crab, Kam-Heong Prawns, mixed Seafood in Spicy Coconut broth and many more. Wednesdays are where lobsters takes the centre stage, the Lobster Rock ’N’ Roll is set to take away all your mid-week blues for the break blues for that much needed indulgent! So dine away with the enthralling range of lobster dishes—boasting fresh Boston lobsters on ice as well as lobsters cooked in different ways. Watch all the actions happen at the open concept kitchen where the chefs get down to cooking the most flavourful Tandoori Lobster and succulent grilled Lobster. Leave some stomach-space for the Signature Lobster Laksa as well; that is one comforting bowl we always go for at J65. But that is not all, J65’s Lobster Rock ’N’ Roll buffet has even more lobster dishes to impress; Baked Lobster Thermidor, Lobster Paella, Kam Heong Style Lobster and Singapore Chilli Lobster are just some to name. Lighter recipes options include Lobster Congee with condiments and Lobster Bisque, which the little ones will love. ’What The Fish’ is yet another new theme at J65 where the buffet is laden with an array of creations – fish dishes, all prepared in different methods. With over 10 unique recipes on the menu showcasing grouper, salmon, red snapper, snow fish, seabass, barramundi and more. Get ready to be blown away by the team’s creativity. Look out for the Fresh Snow Fish Tikka at the Live Station. It is to die for; amazing flavours and tender chunks of fish-meat. There is also the Angoli Fish Head with Bee Hoon in Salted Vegetables Soup, and Grilled Stingray which comes with a selection of complementary sauces chili & kicap sambal, air assam and sambal belacan. There is still more to look forward to for Thursdays. Your dinner continues with the Poached Norwegian Salmon, Hong Kong Style Pomfret, Seabass with Tobiko and Wasabi Cream, Mediterranean Baked Barramundi with Olives, Artichokes, Tomatoes and Herbs, Angoli Fish Head Curry… and the list goes on. 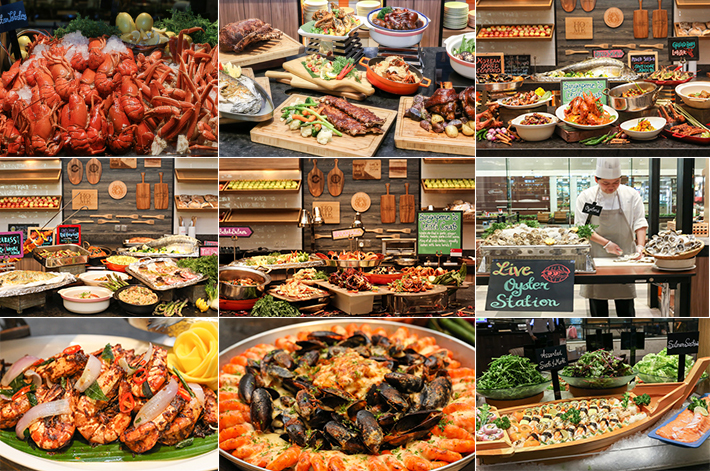 Fridays and weekends are meant for indulgence and you can get that at J65’s Seafood Madness buffet theme. The lavish spread features a plethora of top-notch crustacean dishes for the passionate seafood fans. In addition of the Boston lobsters, snow crabs and mud crabs, Seafood Madness also includes French oysters in their seafood on ice station! Imagine slurping up freshly shucked oysters all night long—it is a dream come true for all oyster lovers. Other dishes in the Seafood Madness line-up that steal the limelight are Singapore Chili Crab, Indian Style Curry Prawn, Kam Heong Style Squid and Spicy Crabmeat Spaghetti. What a way to end a long work week! I would sincerely like to take my mum, husband and sister. My mum would cherish the experience of this cruisine. She has never experienced anything like this before and Iknow that she will taked about it everyday. My mum justed turned 90 years old.